I wish I had more of these to give away, because a few of my friends entered the contest but didn’t win. 😦 Ah well, such is life, right? A lot of people think entering more than once is pointless, but the winner might disagree. Her five entries (3 for subscribing to Misikko’s newsletter, two for following me and Misikko on Twitter) won her the iron! How I determined the winner: I wrote everyone’s name down according to the number of entries they had, and when they commented. For example, if someone had done enough for five entries, I wrote their name down five times, then moved on to the next person. 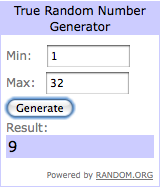 It added up to thirty-two entries, all of which I entered into the generator at Random.org. #9 was the fifth entry for….Phillisha Duffey! Congratulations, Phillisha! If you didn’t win, don’t fret. I’m opening a contest tomorrow for a high-end under eye concealer that has worked wonders for me. Stay tuned, and remember to subscribe to my blog!